Registration begins at 8:00 a.m. and the safety briefing is at 9:00. We will shoot 6 stages without a break. THE WILD BUNCH MATCH SCHEDULED FOR SUNDAY, APRIL 14 HAS BEEN CANCELLED DUE TO WEATHER. Next Wild Bunch match is Sunday, July 14. Registration begins at 11:00 a.m. and the safety briefing is at noon. We shoot 4 stages without a break. We will offer both Wild Bunch and "Mild Bunch". Shooters must have a Model 1911 pistol, SASS legal rifle and a Model 12 or Model 1897 shotgun. Wild Bunch will be $10 for members, and $15 for non-members. To see (and print) the Wild Bunch Registration And Release form click here. "Mild Bunch" scores will not be counted with Wild Bunch shooters. "Mild Bunch" shooters may use a 9mm 1911 pistol, but must use lead bullets. To see additional information and a complete list of our rules and requirements, see our Wild Bunch Information page. 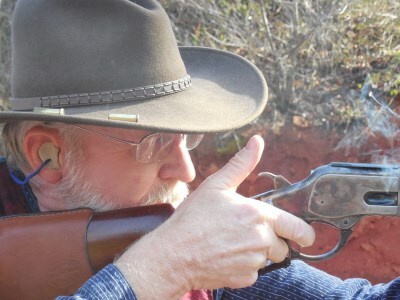 The Piedmont Regulators is an affiliate club of the Single Action Shooting Society . 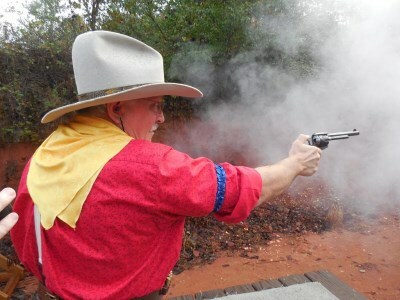 We hold Cowboy Action Shooting matches on the second Saturday of each month at the Georgia Mountain Shooting Association range in Eastonollee, GA. For directions to the range, use the link above or click here . New shooters are welcome! We shoot 6 stages requiring approximately 60 rounds of pistol ammo, 60 rounds of rifle ammo and 25 - 30 shotgun shells. All bullets must be solid lead, low velocity "cowboy loads" and shotgun shells cannot contain shot larger than 7 1/2. All SASS rules apply. To see the SASS Shooter's Handbook click here . For the months of March through October, registration begins at 8:00 a.m. and the mandatory safety briefing is at 9:00. For the months of November through February, registration begins at 9:00 a.m. and the safety briefing is at 10:00. Shooting starts immediately after the safety briefing. A relaxed dress code is in effect for the June, July, August and September matches and for any other matches when Weather.com predicts that the temp will be above 90 degrees in Toccoa, GA. Boots and a SASS-approved hat are required, however, the type of pants and shirt worn is at the discretion of the shooter. Effective January 1, 2017, match fees are $15 for members and $20 for non-members. Buckaroos (age 13 and younger) shoot free. To see (and print) the Match Registration & Release form, click here. When using Chrome and Internet Explorer browsers the form can be completed on-line before it is printed. However, it won't work with Firefox browsers. To see a list of our Club Champions, click here or use the link at the top of the page. Our matches are open to the public and there is no charge for spectators and guests. Eye and ear protection are required. Dress code rules apply only to registered shooters. To see scores for the April match, click here or use the link at the top of the page. For corrections, suggestions, feedback, etc. concerning this site, contact Rainmaker Dave at rainmaker@trailquest.net.